On one end we see people claiming that nowadays very few people are reading books; or in a sense reading is no more a favorite hobby of majority of people. At the same time we see rise of many new authors on regular intervals. As for Bollywood, everyday new aspiring talents are entering the world of Cinema prove their talent and become a star, new authors are entering the literary arena (of course at a smaller pace). Again like Bollywood, some of them becomes the bigger star and some becomes the misery. 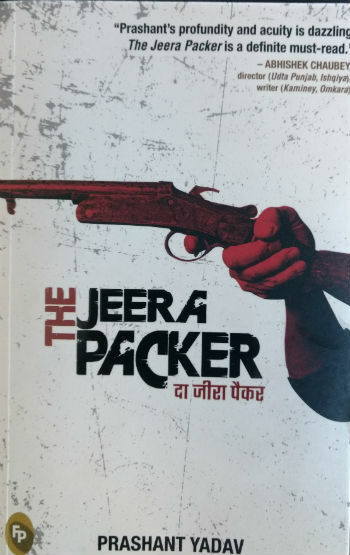 There comes a new author named Prashant Yadav, with his book The Jeera Packer. Let us take a look at what the book offers, and whether it is worth to go for (of course, from our perspective). The book’s plot can remind you of any masala movie of Bollywood without a doubt. And eventually when you got inside it, you will explore something you have explored in movies like Gangs of Wasseypur, NH10, Dev D, Delhi Belly, Rajneeti, Jai Gangaajal, Aarakshan and others. The Jeera Packer is the story of a former sniper (well, rather better call him a shooter) who worked for a politically influencing figure. He have eventually decided to turn back from the road of crime and get settled in life like a normal man. Of course, his inspiration was his lady love. He is now settled with her and in their small family they have a teenage boy too. They are living their life happily. Their source of income is a small shop they are running. While most of the control of the shop is with his wife, the protagonist is more than happy to be her helping hand. He assists her in running the shop, and when get free time he packs Jeera in small pouches, in the room associated with the shop. He have an old friend who is a bike mechanic; for whom Bullet is the ultimate muscular bike. One day, the protagonist got to know about the price his father-in-law have paid so the protagonist have a peaceful life. From this point of time, his life takes a turn and what happens then-after is better to explore in the book. Here are some of the nice pieces of writing from the book. We have tried to not to include spoilers as much as possible. … because the prince could do no wrong. Just like the king could do no wrong. What you don’t do never really leaves you. What you let go of never lets go of you. When things not done haunt, nothing comes to rescue. When cries left unheard chase, you are on your own. Missed chances do not hurt just you but everyone connected to you. Your child, your wife, and your family pay for what you lose out on. Don’t you think that these lines directly comes from the tales of PanchTantra? Enemies embedded as stupid friends who screw you with best intentions in their hearts? Have enough of them and even the worst of your enemy will not be able harm you, because not much of you will be left to harm. Never kick the fire that fries your fish. This is what happens when the lion sleeps for too long… every rat with lip hair and tail roaming to own private lionhood. Who will go where only future can tell. Let us not play God. This is one of nice piece of writings from the book which explores many things at a glance. The reality, the foolishness, a satire and much more. The professor looked out and saw bikes, cars, tempos and trucks fighting for space. Several bikes climbed on the sidewalk to beat the traffic. Just beside the sidewalk, two dogs fought each other as if the future of the world depends on which of them won. A week of regular running makes you younger than years of thinking about it. Friends stand long after brother run away. I want you to do what makes you happy. Money is not important. You are. We will not tell much about the writing as we have mentioned it in the above segment, through various pieces from the book directly. The book is definitely a good thriller. Most of the Indian readers can draw parallels with many political incidents. The writer have the skills to write convincing thrilling events and explaining scenes. He took the backdrop of North-India, where politics is at it’s peak. By staying there he have witnessed many things through local newspapers, Bollywood movies, and personal experiences. He have then crafted them well in the form of a novel. The marriage of underworld and politics is written effectively in this book. More importantly, how it leads to murders and the effects and side effects of this marriage in the live lives of common and special men is wrote quite effectively. Most of the characters are built up nicely. They grow showing the their characteristics effectively. The author have a clear vision of what he is going to explore and thus he is able to put it all together in good manner. The influence of real things on the author is clearly visible in his writing. Also the mention of various Hindi film songs at various places makes the book interesting. The only problem stays with the book is usage of abusive words/phrases and portrayal of steamy scenes. Of course, the author have his vision of reality, and he could have done it to justify that. It however makes the book’s target audience to be the adult readers only. It is stated that Truth is stranger than the fiction and the real world could have been that harsher. And, you got to know it when you visit any lower class locality, use of such words is common. And these days it is common to see it in movies and even on Television. Whatever it is, in terms of quality literature, it should not be there. Prashant is a well educated fellow (he went to IIT Kharagpur, IIM Ahmedabad and Stockholm School of Economics); so he knows his target. It is a typical Bollywood Masala Movie kind of a book with abusive words and phrases present at lot of places. It is good in literary quality at some places and have all the ingredients of a good thriller, it is strictly for adults.